We are proud to announce that BLC Studios—Maverick Hockey Weekend just received a Student Crystal Pillar Award for Newscast Excellence from the Upper Midwest Emmy® Chapter/Foundation in the category of College – Sports: Live Event. 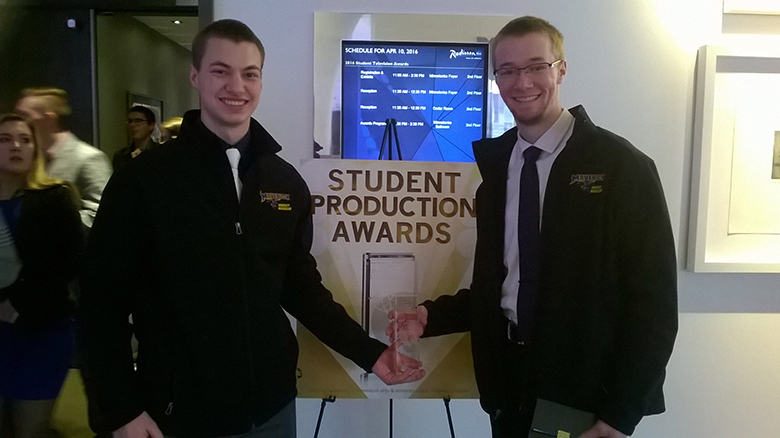 This is the third time BLC Studios has received a student crystal pillar award. This year, NATAS (The National Academy of Television Arts & Sciences) – Upper Midwest Chapter received more than 260 entries from 40 different high schools and colleges/universities from across our region, which covers Minnesota, North Dakota, South Dakota, Iowa, and Wisconsin. Students compete in 20 categories. A full list of 2016 award recipients is available at midwestemmys.org. Maverick Hockey Weekend is the show name for all productions associated with Minnesota State Hockey. MHW broadcasts over 35 men’s & women’s hockey home games per season and also operates the state-of-the-art Daktronics video board at the Verizon Wireless Center in Mankato, Minnesota. MHW just completed its 15th broadcasting season.